The chance to advance in the NCAA Tournament and face No. 1 seed Gonzaga will be on the line Tuesday night when the Fairleigh Dickinson Knights and Prairie View A&M Panthers meet in a First Four matchup. Fairleigh Dickinson (20-13), which defeated St. Francis to win the Northeast Conference Tournament title, is 0-5 in five previous NCAA Tournament appearances. Prairie View A&M (22-12), which won the SWAC regular season and tournament titles, is making just its second NCAA Tournament appearance and its first since 1998. Tip-off is set for 6:40 p.m. ET at the University of Dayton Arena in Dayton, Ohio. Fairleigh Dickinson is favored by two-points in the latest Fairleigh Dickinson vs. Prairie View A&M odds, while the over-under for total points scored is 149. Before making any Fairleigh Dickinson vs. Prairie View A&M picks of your own, be sure to check out the NCAA Tournament predictions from the SportsLine Projection Model. Now the model has locked in on Fairleigh Dickinson vs. Prairie View A&M. We can tell you it's leaning over, and it has a strong against-the-spread pick that cashes in nearly 70 percent of simulations. That one is only available at SportsLine. The model has considered that Fairleigh Dickinson is playing its best ball of the season. The Knights have won eight straight games and 14 of their last 16 overall. Their excellent play recently is due in large part to their shooting. They rank fifth nationally in 3-point shooting (40.3 percent) and 30th in field goal percentage (47.8). In the team's 85-76 victory against St. Francis in the conference championship game, Fairleigh Dickinson took its shooting accuracy to another level. Led by senior guard Darnell Edge, the team shot 63.8 percent from the field, 53.8 percent from beyond the arc and 90.0 percent from the free throw line. But just because the Knights have been shooting the ball extremely well doesn't mean they'll cover the Fairleigh Dickinson vs. Prairie View A&M spread in the First Four 2019. Prairie View A&M has been on a roll that's unmatched by almost every other team in the country. The team's 95.5 winning percentage since the start of the season is second only to Wofford's (100.0). In the last seven games, the Panthers have been particularly hot, winning by an average of 17.4 points per game. Led by Gary Blackston (15.2 points per game), the Panthers excel at forcing turnovers. They force 18.2 of them a game, which ranks third in the country. They are second in the nation in turnover margin per game at plus-5.5. So who wins Prairie View A&M vs. Fairleigh Dickinson? And which side of the spread can you bank on in nearly 70 percent of simulations? 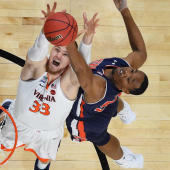 Visit SportsLine now to see which side of the Prairie View A&M vs. Fairleigh Dickinson spread to jump on, all from the advanced model that's up more than $4,000 on top-rated college basketball picks the past two seasons.